Some landscapes simply demand a view from above. And sometimes these views can only be done justice aboard a helicopter. Indeed, nothing compares to the heart-expanding feeling of liftoff, the sound of the whirring blades, and the jaw-dropping sights from on high. 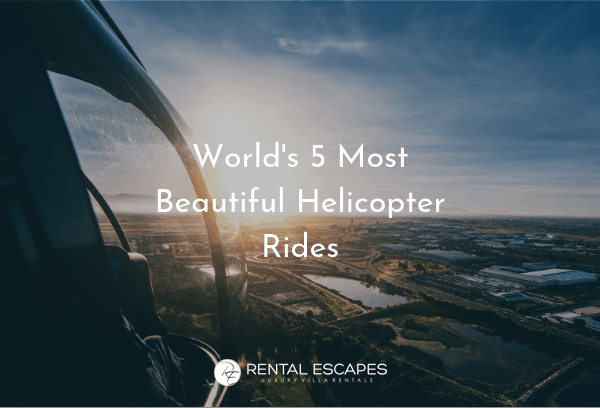 Daredevils and photography enthusiasts alike will find an unforgettable experience in these 5 most beautiful helicopter rides! The fourth-largest of the islands, Kauai is one of Hawaii’s most untainted natural settings. Fly through the monumentally vivid red valley walls of Waimea Canyon, take in the jagged cliffs and tranquil valleys of the Napali Coast, and explore the Waialeale Crater where waterfalls are sure to surround and astound you! You’ll sail high above the Hanalei Bay’s white crescent sand beach where you can snap some unobstructed shots of the true blue waters below. Kauai offers spectacular views at every turn! On the Big Island, prepare for the exploration of a lifetime in the volcanic landscape of Hawaii Volcanoes National Park. Think glowing lava against a backdrop of vivacious waterfalls and lush rainforests. This tour takes you over Kilauea, one of the most active volcanoes on earth, which has been spouting rivers of lava since 1983. Believe it or not, you’ll get close enough to feel the heat radiating from this 500,000-year-old sensation. And the picture perfect falls are sure to cool you down as you float on by! Dubbed a National Monument in 1908 by President Theodore Roosevelt, the Grand Canyon keeps on stunning visitors over a century later. Cut by the Colorado River and running through Arizona, the Canyon shows off Proterozoic and Paleozoic strata in a colorful display, all set against a clear blue sky. There are two main tours of the Canyon: one takes you over Kaibab National Forest, Marble Canyon, Point Imperial, and the iconic North and South Rims, and the other takes you outside the boundaries of the park, and over an area owned by the Hualapai Tribe. Italy’s breathtaking Amalfi Coast has a reputation for being gorgeously romantic—with good reason. Its glimmering blue waters, charming towns, and inspiring seaside cliffs ensure the region more than lives up to all the hype. While exploring the towns on foot and indulging in the area’s incredible cuisine is a wonderful way to spend your time, be sure to make time to take to the skies too. Excursions from Capri, Naples, Ischia, and Sorrento are all available, with stunningly unrivaled sights along the way, and opportunities to stop in various towns, Pompeii included! They don’t call Las Vegas the entertainment capital of the world for nothing. And this is always truer at night when the spectacular views of the Bellagio fountains, the never-fading laser beam at the Luxor, and the dazzling Stratosphere Tower can be seen in all their glory. Experience the thrill of a helicopter ride over the Las Vegas strip: fly high above the megaresorts, take in the New York skyline, and know that you’ve seen one of the worthwhile wonders of the man-made world. Book your luxury vacation rental with Rental Escapes today to get in touch with one of our VIP concierges. They would be delighted to help you plan the helicopter tour of a lifetime!